Photo of the day: Budae Jjigae @ Nolboo. Photo credit: Aaron. 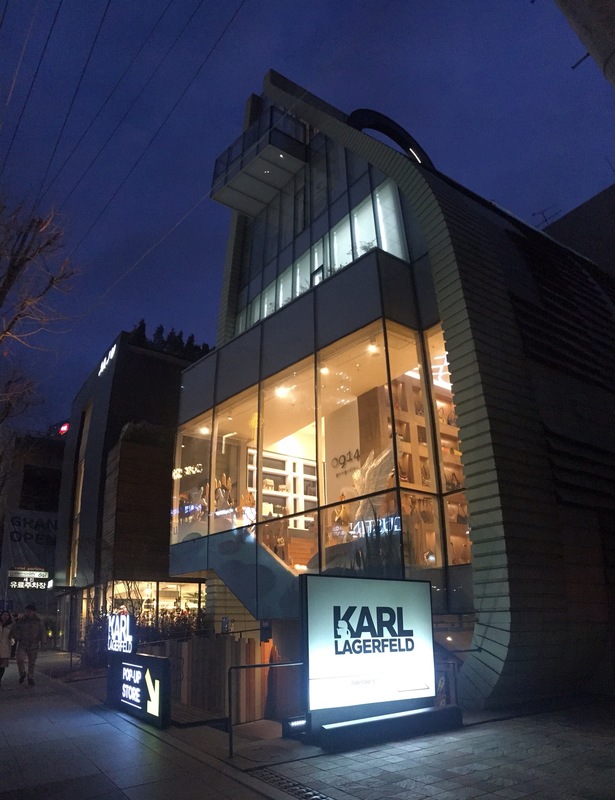 Today, we had the chance to explore the trendy neighbourhood of Garosugil, located in the western portion of Gangnam. This area is known for its tree-lined streets, although, at this time of the year, there wasn’t too much to see. There were unique boutiques everywhere as well as some more well-known clothing franchises. On the side streets, there were plenty of cafes and fusion restaurants. 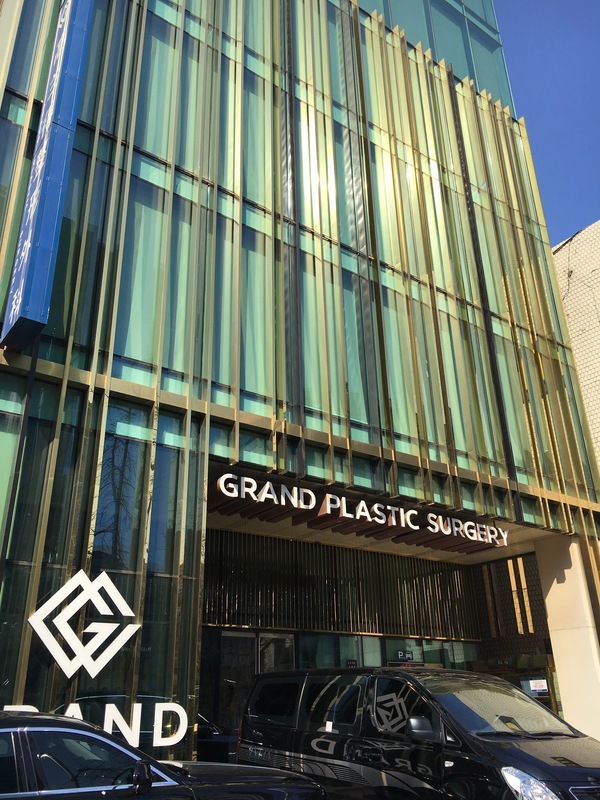 You will find a plethora of cosmetic surgery clinics in Garosugil. The restaurant which we had lunch at was called Better Than Beef. They specialize in pork belly. The first floor decor is very quirky, whereas the basement decor is more old-school European. We ordered the original pork belly and the tofu gratin. The pork belly came in peanut sauce and perilla leaf on top. It was not my favourite as it was quite dry. The tofu gratin was pretty delicious and super cheesy. Despite its western flare, the meal kept true to its Korean roots with its side dishes and rice. 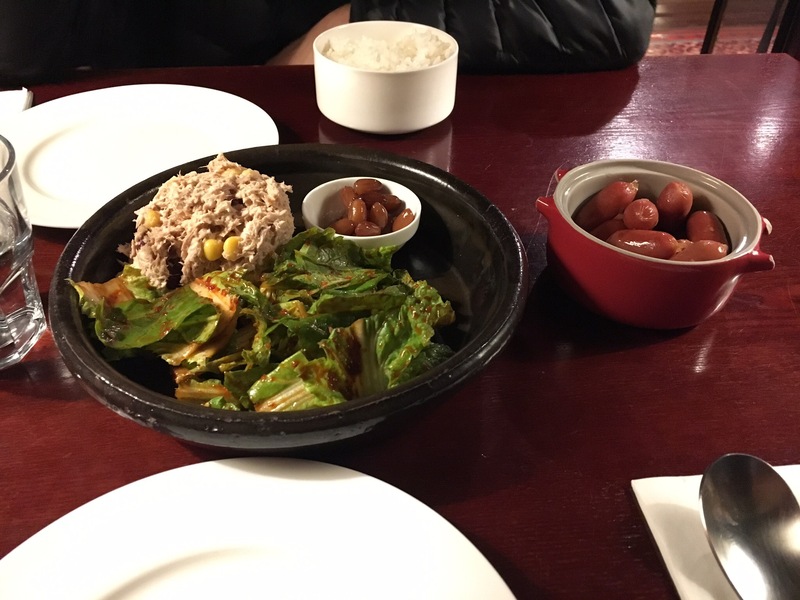 The side dishes here were very interesting, including tuna salad, pickled peanuts, regular salad and mini hot dogs. Overall, it was an interesting menu to try out if you want a change from the regular Korean food. The appetizers/side dishes @ Better Than Beef. 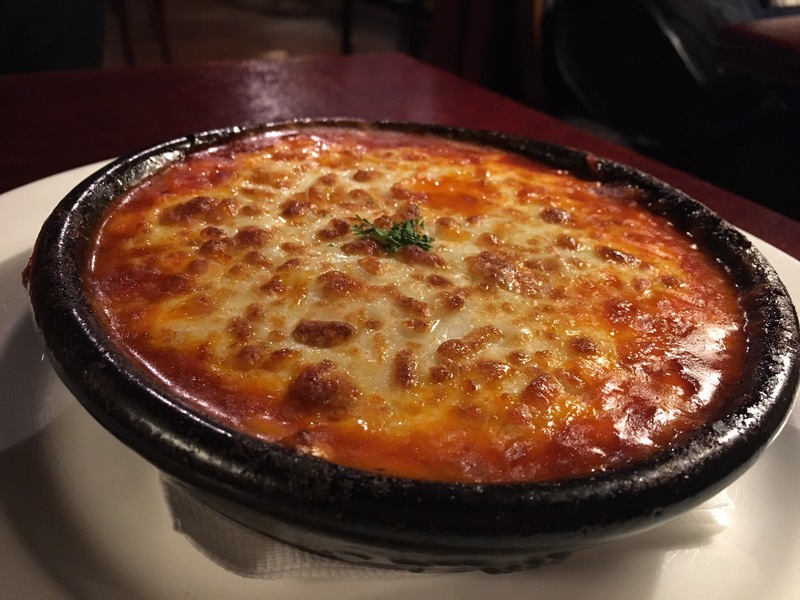 The tofu gratin @ Better Than Beef. 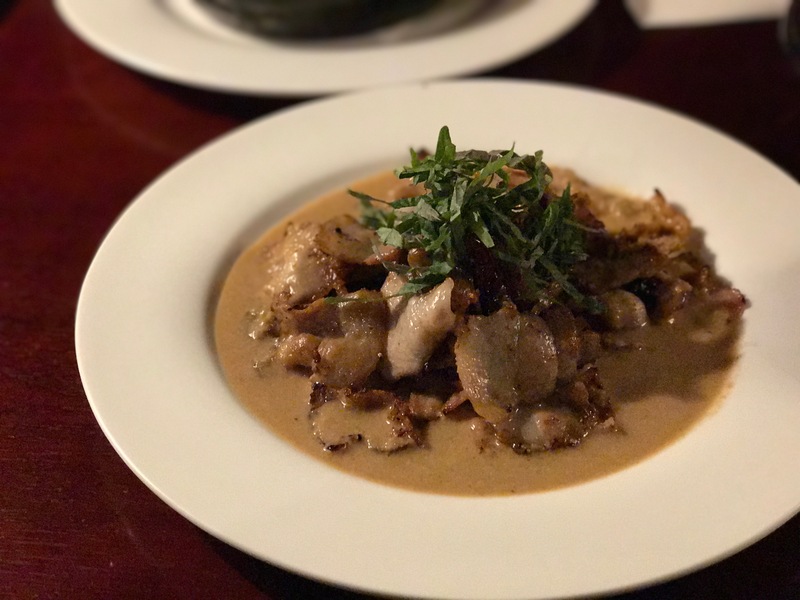 The original pork belly in peanut sauce. Photo credit: Aaron. Next, we were hoping to find a cafe to do some work. Despite being known for having many cafes, most of these cafes were more dessert cafes for girlfriends to have a nice chat and not so much for people who want to get some work done. We found Hammersmith Roastery, which was not too noisy, so we decided to grab some tea/coffee here and get some work done. Unfortunately, it was really dark and cold, and the wifi was not working very well, so we decided to cafe-hop after we were done our coffee/tea. 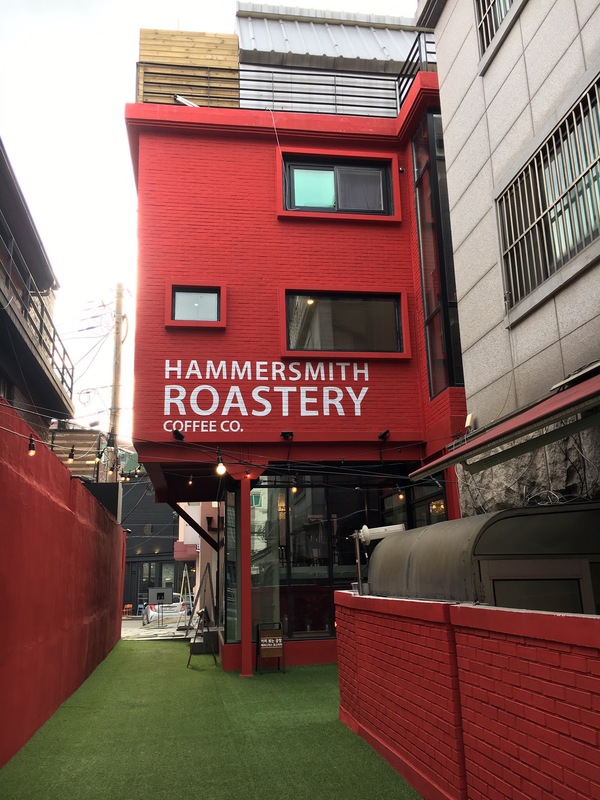 We’ve seen quite a few Coffeesmith’s around Seoul, but haven’t had the chance to visit one, so we decided to check this one out. It was huge with plenty of seating. It’s been a while since I’ve heard some American top 40 so that was really nice. Aaron had their cappuccino and we shared their cheese soufflé cake, which was actually not bad. We sat upstairs facing the large windows, perfect for people-watching. The table was actually a large monitor, with input USB ports. It turned on at one point when we tried to charge our devices. There was a designed smoking room, but it wasn’t entire airtight; therefore, there was, unfortunately, a slight smell of cigarettes in the coffee shop. 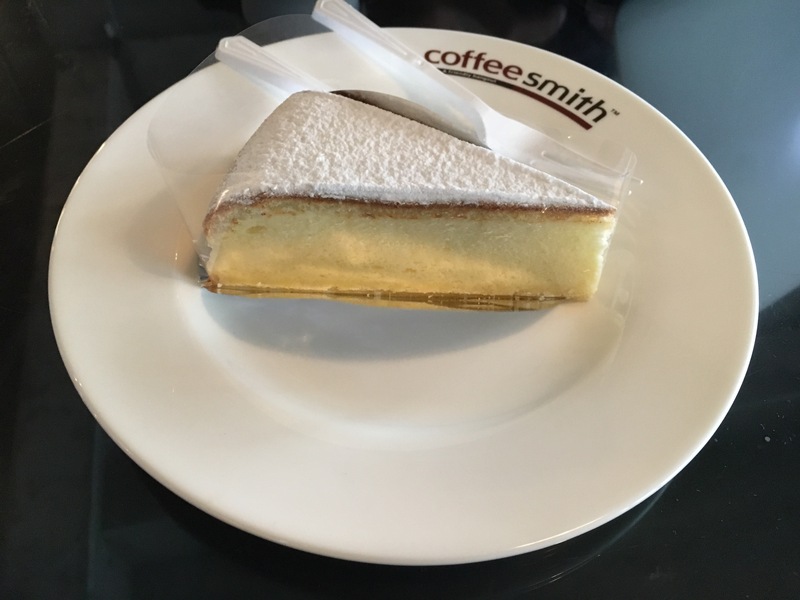 Soufflé cheesecake at Coffeesmith (coffee shop #2). With time, I decided to go and take a walk around the area. There were a variety of stores, ranging from cute more-upscale boutiques to larger more affordable stores such as 8 seconds. There are also department stores like Jaju, which was like a Korean version of the Japanese Muji. I walked by Simone Handbag Museum but wasn’t too interested in visiting it. The street itself wasn’t too long and the stores began looking bigger and more upscale as I approached Apgujeong. 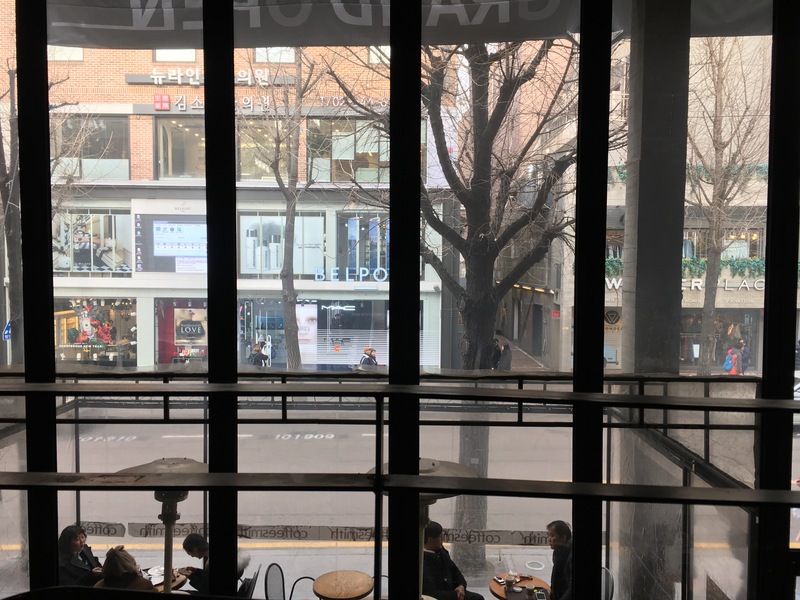 The view of Garosugil from Coffeesmith. Simone Handbag Museum in Garosugil. 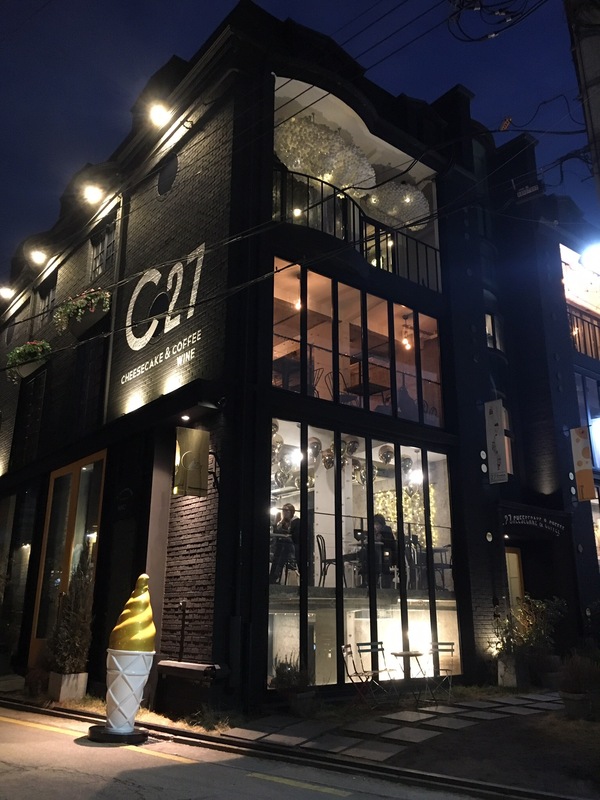 A really nice cheesecake cafe on one of the side streets of Garosugil. I went back to meet up with Aaron, then we walked around for a bit trying to look for a good restaurant for dinner. We were not too interested in the choices we had here, so we decided to head back to Gangnam station, where there was definitely more happening. The streets were even more crowded than when we came yesterday, now that it is a Friday night. The night is still young but people are already unable walk straight and are passing out on the street. I’ve been hoping to try some Odeng (fish cakes) since the beginning of this trip, but haven’t had the chance yet. We passed by a stall selling it on our way to dinner and decided to try one. Supposedly, these wavy fish cakes on a stick are meant to be self-serve, along with a cup of the broth. You can pay at the end after tallying up how many you’ve consumed. We only had 1 between the 2 of us and the older lady at the stall was teasing us why we did not get more. (At least that was what I thought since she was speaking Korean the whole time). This was a great snack for winter to warm us up, especially with the hot broth. We decided to go to Nolboo for some Budae Jjigae, since Aaron enjoyed the other one we had in Hongdae so much. Nolboo is a chain, so other locations can be found throughout Seoul. Again, their menu had no English and I was all prepared to order in Korean, but the lady started speaking Mandarin to me. As a matter of fact, her Mandarin was probably even more fluent than mine! Chinese is definitely a more useful language here compared to English. We ordered the set menu with thinly sliced beef, noodles and a pop. This restaurant definitely was bigger and appeared more like a chain restaurant compared to Simpson Tang. When the stew first came, we were disappointed in its colour, which was quite pale, but we found out all the contents have sunk to the bottom. After placing the meat, dumplings, noodles and other carbs from the separate plate into the stew then mixing it, it started looking more like what we were expecting (see featured image above). This Budae Jjigae had a lot more in it compared to the one at Simpson Tang. Their spam pieces were larger, allowing us to taste it better. The mini dumplings were a nice touch. There were also a variety of carbs such as udon, macaroni, rice cakes and other unidentifiable chewy, gooey things. Along with the bowl of rice, I felt this was a bit carb overload. I did appreciate the taste of the macaroni with the broth though. It reminded me of eating a tomato-based pasta. Overall, I enjoyed this Budae Jjigae more compared to the one at Simpson Tang. One interesting thing we noticed while we were here was there was a lady who appeared to be broadcasting a live Mukbang. At least that was what we assumed, since she was eating in front of her phone and she had viewers commenting on her screen. That was pretty fascinating to witness in person. I guess it is a really popular trend here. Aaron was really intrigued by the Makgeolli we had the other night, so he wanted to check out another place in Gangnam, which was actually made their own Makgeolli. 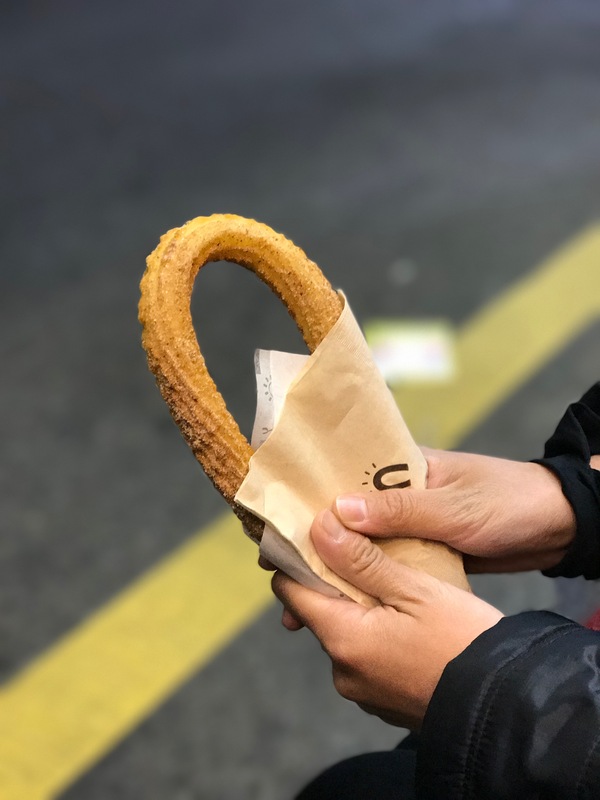 But first, we passed by a churro stall called Street Churros, which according to Aaron instinct, means we must stop for one. It was really good churro and Aaron even felt it was probably the best churro he has ever had – crunchy on the outside but soft and a bit chewy on the inside. Churro from Street Churros. Photo credit: Aaron. We arrived at the brewery called 느린마을 양조장. It was categorized as a “bar” on Foursquare, so we walked right in. After we were seated and were ready to order, was when we found out they had a minimum order of food. We were really not hungry by then and decided to just buy some Makgeolli to go. This Makgeolli was actually even tastier than the one we had the other day. It tasted very fresh and it was really nice served chilled. 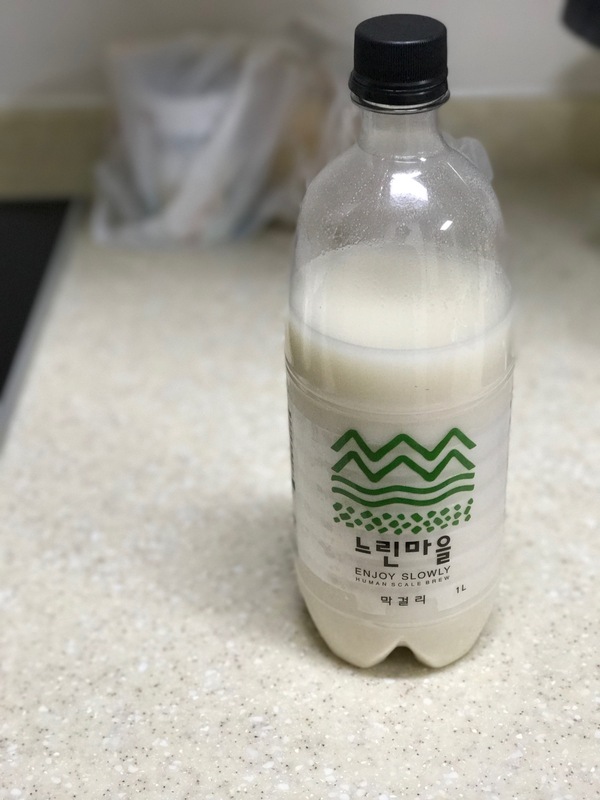 Makgeolli straight from the brewery! Aaron’s new favourite. Photo credit: Aaron. I can’t believe our time in Seoul will soon be coming to an end. I feel like there are still so many neighbourhoods to explore and I am not yet ready to leave. We chose not to visit the palaces and other touristy attractions but there were still many other things to occupy our time with! See you tomorrow, as we spend our last day in Seoul.